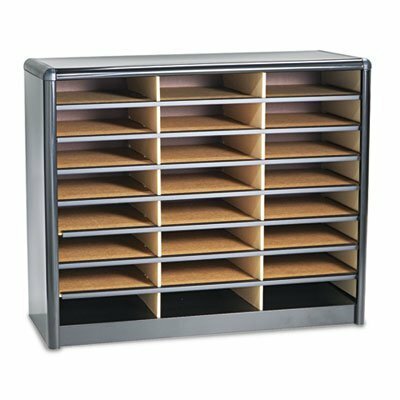 This simple yet effective organizing tool has so many uses: a mailbox, material holder, stationery sorter, craft or office supply storage. Steel shell and support shelves add stability and durability. Letter size, 9 3/4w x 12 1/2d x 2 1/2h compartments are made from heavy-duty corrugated fiberboard. Wide shelf front serves as label area (labels included). Easy assembly with quick-locking fasteners. Over-sized compartments hold up 550 sheets of paper. Literature Sorter Type: Open Front; Number of Compartments: 24; Compartment Size: Letter; Material(s): Steel; Corrugated Fiberboard. Value Sorter? easy-to assemble literature organizer with steel shell and support shelves has letter size compartments.